Double Sphere Flexible Rubber Joint is designed for piping systems to absorb pipe movements, relieve stress, reduce system noise/vibration, compensate for offset and to protect rotating mechanical equipment against start-up surge forces﻿. Widely used in chemical industry, construction, water supply, drainage, petroleum, refrigeration, sanitation, fire protection, power projects. 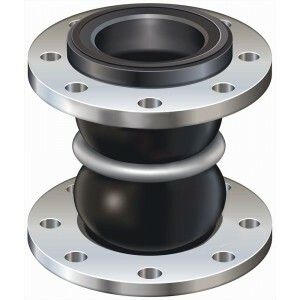 SGV double sphere rubber expansion joints are inherently stronger than the conventional hand-built style spool arch type. Internal pressure within a “sphere” is exerted in all directions, distributing forces evenly over a larger area. The spherical design “flowing arch” reduces turbulence and sediment buildup. Thermal movements appear in any rigid pipe system due to temperature changes. Double ball rubber expansion joints allow for axial compression or axial extension, lateral deflection as well as angular movement.